Twenty-five years ago, the world’s highest-stakes poker game was played in Reykjavik. This characterization comes from a man with a pretty good poker face, George Shultz, who was the US Secretary of State at the time. Secretary Shultz appeared to be one of only three participants at the Reykjavik summit who had no reservations about what transpired. The other two were the guys holding all the chips. The story of the Reykjavik summit has great dramatic potential; Ridley Scott will reportedly try his hand at the film version. No explosions. No digital animation. But great dramatis personae, and a plot that is far too convoluted to summarize adequately here. Suffice it to say that the story is about two supremely confident, unorthodox risk-takers who were not in the least bit enthralled with nuclear weapons. They happened to be the presidents of the United States and the Soviet Union. They wanted to dispense with agonizingly slow and overly scripted strategic arms negotiations and cut to the chase. These risk-takers were eager to meet face-to-face, even at an unscripted summit. 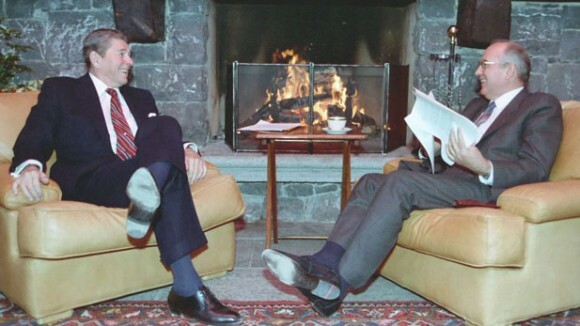 Ronald Reagan came to Reykjavik expecting exploratory talks; Mikhail Gorbachev brought proposals that took the US delegation by surprise. Gone were all of the usual Soviet ifs, ands, and buts. Gorbachev had only one condition, and he saved it for the last act. Reagan sought to make nuclear weapons impotent and obsolete by means of his Strategic Defense Initiative. Gorbachev parried with a more direct approach. The Reagan administration had previously proposed lop-sided strategic arms reductions, including cuts in Soviet “heavy” missiles. Gorbachev’s rejoinder was, in effect, “You want deep cuts? How about fifty percent cuts for both of us, including Soviet heavy missiles?” This scale of reductions was previously thought to be preposterous when first advocated by George Kennan. Let’s do this in five years, Gorbachev proposed. Euro-missiles? The Reagan team had previously proposed to eliminate all Soviet deployments and, in turn, the US would not deploy new missiles. Supporters of this gambit believed it to be unacceptable to the Kremlin. Gorbachev agreed to Reagan’s zero option. This would make a good movie, no? These back-of-the-envelope proposals were torn up when Gorbachev demanded that the SDI be confined to laboratories for ten years and proceed thereafter only by mutual consent. Reagan would not sacrifice his beloved Strategic Defense Initiative, not even for his vision of a world without nuclear weapons. Had another US president engaged in summitry along these lines, he would have been subject to impeachment. (Alternatively, for Gorbachev, there was the Seven Days in May script.) But Reagan was untouchable, and he and Gorbachev remained undeterred. Their free-lancing laid the groundwork for the 1987 Intermediate-Range Nuclear Forces Treaty that removed three categories of missiles from the European chessboard, and the 1991 Strategic Arms Reduction Treaty. These treaties, direct outgrowths of Reykjavik, broke the back of the nuclear arms race. I propose that we help Ridley Scott cast his movie. Who might play Reagan? Gorbachev? Shultz? Richard Perle? etc. To get the ball rolling, I suggest that Edward Hermann play Reagan. Playing George Shultz: the late Leo McKern — the guy who played Rumpole of the Bailey and was in countless movies. He’d have to lose the accent, of course. Wayne Knight could play Gorbachev. Reykjavik warrants a movie. While the summit was deemed a ‘failure’ the reality was that much of the proposals became reality. Even following much the same time scale of the proposals. I think the keystone to post cold war stability was still CFE and the breakup of the Warsaw Pact, but Reykjavik deserves it’s place. Amazingly you don’t see the right on either side making credible and prolonged policy pushes to rebuild the strategic arsenals. The real victory of Reykjavik was everyone in essence has accepted it in the long run. In the coming decades we may look back to our current era of depressed stockpiles as the ‘Reykjavik Era’ should the nuclear and conventional arms races reignite in the coming multipolar world. The hard-right hawks in both nations continues to undermine progress (and bankrupt their nations): there seems some deep need for a twin nemesis. I was just at the Los Angeles summit at Reagan Library with all the players from Reykjavik. Yes, the same argument about SDI is still there, but the Russians (and the Chinese) while suspicious seem willing to along with the co-operation regime. General Cartright was there and offered to share the threat board information with them in real time, I don’t know if that is new or not). The devil is always in the details, but it was a very, very, positive summit (well, minus the French and Israelis, but they are a roadblock to be crossed five or ten years from now.